Announcement! I have a custom texture pack to share. Some of the guys on the server know I've been testing this off and on today. 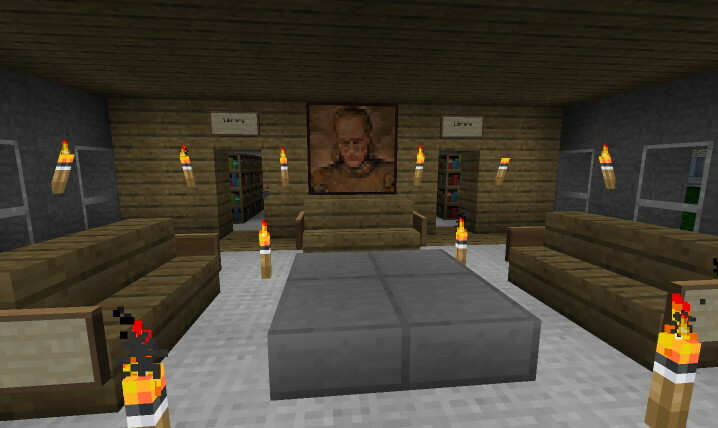 I've taken the original Minecraft textures, spliced them with the Painterly, Quandary, and Coterie Craft packs (and small bits of others), and manually edited many bits here and there to my liking. Basically, I'm trying to retain the "spirit" of the original Minecraft theme while improving upon it in select ways, as opposed to many texture packs that try replacing it with a whole new style. 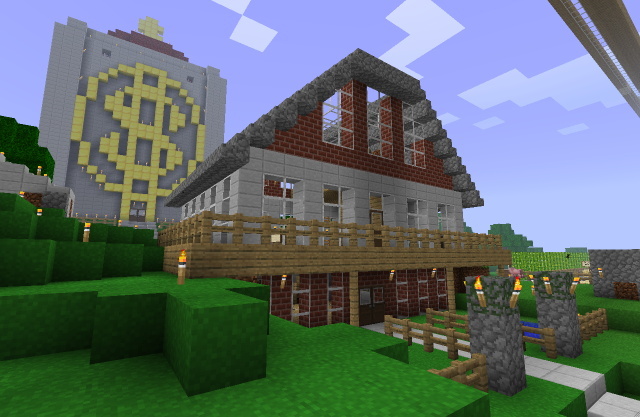 Currently fully compatible with Minecraft 1.12. When you download that file, do not unzip it. If your browser opened and unzipped it for you, turn that off ("Open 'safe' files" is a security risk anyway) and try again. Put the zip file in /Users/yourname/Library/Application Support/minecraft/resourcepacks/ and restart Minecraft. On the main menu, choose "Mods and Texture Packs" and select it. Done! Note that as of Minecraft 1.6.1, the folder is called resourcepacks, not texturepacks. I may continue tweaking some of the textures, and I'll probably just quietly update this post when I do. Thoughts good, bad, or indifferent? The renderings I see here look far less ugly than much of the earlier stuff I've seen. I think it's a terrific start and that you're only going to make it nicer. I think the effort you've put into this is worth it. Oooh. This is very nice. The cobblestone looks so much better. Matches the stone and lightens things up a bit. 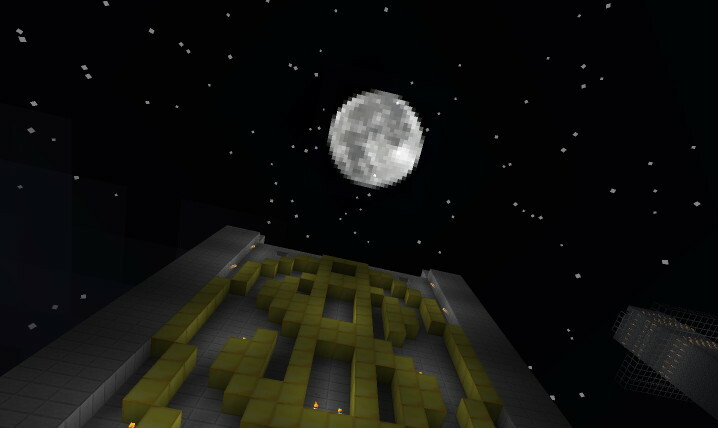 And a real moon! Super awesome work Mr. President. Are the sounds the same? I don't know if it's just the pleasant visuals or what, but the grass just feels softer. And the temple looks all sorts of awesome with "clear" glass. Gah! I was going to bed now too! Maybe I'll wait 'til tomorrow. It'll be that much nicer to start fresh with the world looking so much nicer. I love the captures you've taken. Certainly makes it more appealing to join the club. Signed on just to try the new pack. I like! Funnily enough, my first aborted attempt at making a texture pack was in the style of Zelda: A Link to the Part before I realized that those sprites wouldn't translate well to this 3D medium. 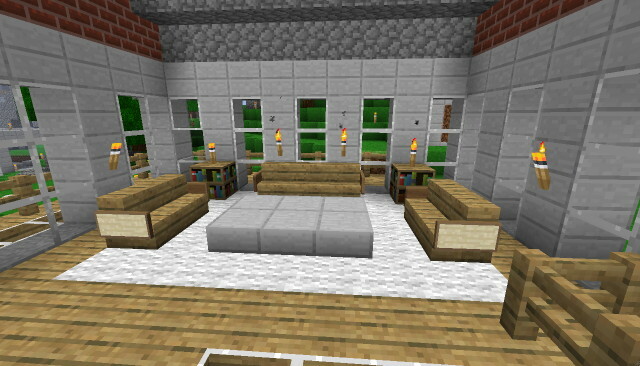 My house looks awesome with that texture pack, so I'm a fan. Announcement! I have a custom texture pack to share. Some of the guys on the server know I've been testing this off and on today. I've taken the original Minecraft textures, spliced them with the Painterly and Quandary packs (and maybe small bits of others), and manually edited many bits here and there to my liking. Basically, I'm trying to retain the "spirit" of the original Minecraft theme while improving upon it in select ways, as opposed to many texture packs that try replacing it with a whole new style. When you download that file, do not unzip it. If your browser opened and unzipped it for you, turn that off ("Open 'safe' files" is a security risk anyway) and try again. Put the zip file in /Users/yourname/Library/Application Support/minecraft/texturepacks/ and restart Minecraft. On the main menu, choose "Mods and Texture Packs" and select it. Done! Would you please add this info to the first post? Thanks. A brief summary is already there, linking back to that more detailed post. I didn't want to make the first post multiple screens of text long. I should have been more specific, I really wanted the file linked to from the OP. I got tired of my MBP dropping my connection so I moved to Beast and installed Minecraft on there. Then I needed to find the texture pack and this thread was my easy way. Oh well, thanks. Ah! I understand now. Post edited. Beside adding support for the new 1.2 items and blocks, I've also made a few other minor tweaks. 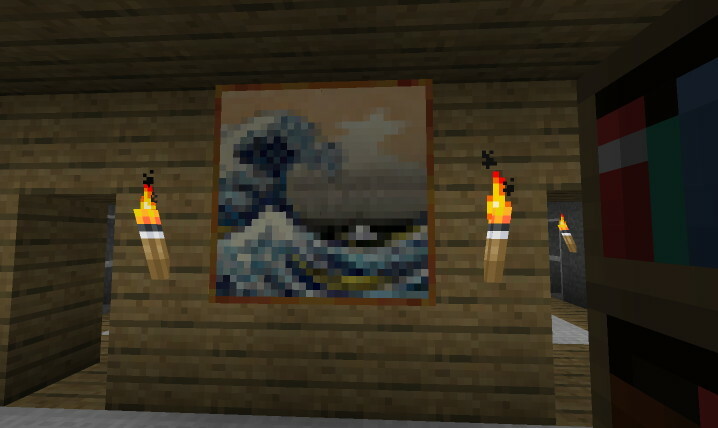 Since paintings now work properly in SMP, I'm also replacing some of the crappy built-in paintings with greater works of art. Remember: Don't unzip this file! Drop it in ~/L/AS/m/texturepacks/ directly as-is. I just updated the texture pack. I increased the paintings resolution and fixed/tweaked various minor bits. Texture pack updated! Go grab it from the link in the first post, else the new items will be invisible to you. I've been slackin' and haven't gotten around to officially adding the "cookie" sprite to my texture pack, but fortunately for me cookies in MC are exceedingly rare. I have a few other tweaks to apply too; so, hopefully I'll be updating this tonight. What other changes are in the works? Not much. Mostly picking up a few tweaks I liked from Painterly, such as the armor icons (don't know why I originally used the ones I did) and the wolf texture with the more obvious bandana to indicate ownership. Texture pack updated! Go grab it from the link in the first post and replace the version you have with it. 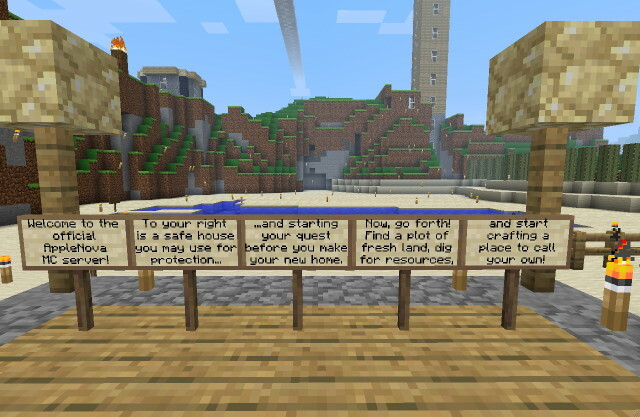 My texture pack now "properly" supports beta 1.4. Previously, elusive cookies would be invisible. Now they're visible, but just as elusive. I also rolled in a few other minor texture tweaks along the way. Did the chickens switch species? I did an informal poll in-game asking people if they thought of the "bird" mob as a chicken or duck. 5 out of 5 said "duck". The ducks have it! Ah, in that case, cool! Hadn't thought about skinning animals to that degree. Wait... I know they all lay eggs but do they quack now?? Brad, do we have mother clucking ducks???!!! Wait... whaaat? Who eats duck eggs? Is this a Canadian thing? I love the new leather armor icons. Thx Brad! 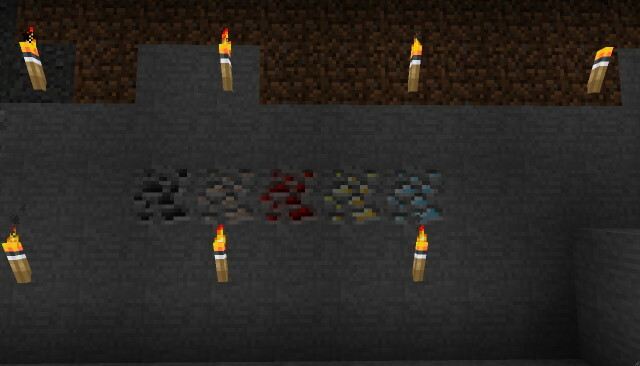 Texture pack updated for beta 1.5! Go grab it from the link in the first post and replace the version you have with it.